Brother Claud and Mrs. Carol met when they were about five years old at his dad's church in Fort Worth. They were married shortly after graduating high school in 1973. They have three adult children – Kimberly Dianne Boling (promoted to Heaven on February 14, 2012), Angela Slate, and Claud Slate, Jr.
Angela lives in Rogers and is an active member of Colonial and is involved in several ministries. Claud Jr. is married to Abby (Tharp). They served on staff at Colonial for five years and then, in October of 2014, entered into full-time evangelism(traveling and representing Triple S Christian Ranch). 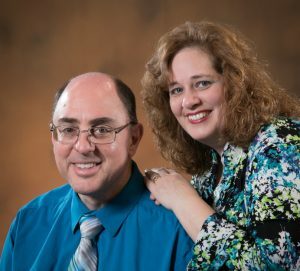 As of August of 2018, Claud Jr. became the pastor of Fireside Baptist Church in Owasso, Oklahoma. The Slates have 10 grandchildren: Anna, Joseph, Alyssa, and Christopher Boling; Addison, Ava, Aubrey, Trey (Claud III), Alivia, and Canon Slate. Pastor Slate was raised in a pastor's home and surrendered to God's call to preach at a very young age. In August of 1979, after serving in the United States Army, he enrolled in Bible College. He graduated with a ThG and later attained his Bachelor’s, Master’s, and Doctor of Ministry degrees in Christian Counseling. Pastor Slate served as Youth Pastor and Bus Pastor in El Paso, Texas, Senior Pastor in Alamogordo, New Mexico, and Senior Pastor in Mapleton, Illinois. After Illinois while recuperating from medical illness, he spent just over a year doing evangelistic work. In August 2004, he and his wife moved to Rogers, Arkansas, where he became the Senior Pastor of Colonial Baptist Church (formerly known as Bible Baptist Church). Mrs. Carol is actively involved in a number of ministries including, choir, Homebuilders Sunday School class, L.I.F.T., and serves as the church secretary/receptionist. You can always find Mrs. Slate busy helping in the nursery, the kitchen and most any other service ministry. She is known for her tender, servant, heart.